Yesterday we celebrated the launch of the new DS 3 & DS 3 Cabrio models by DS Automobiles. Heavily revised for 2016, both the DS 3 hatchback and DS 3 Cabrio versions offer a wide range of upgrades for your driving pleasure! Here's an interesting fact: more DS 3 and DS 3 Cabrio models were sold in the UK last year than in France or any other global market. When looking at all the features the DS 3 offers, it's no wonder why people in the UK want to experience the charms of this hip and stylish Parisian supermini. Now let’s take a look at these magnificent upgrades in more detail. Out with the Citroen style ‘double chevron’ and in with a new square-cut grille, the face of the DS 3 has now come into its own. Smarter headlights neaten up the front-end, combining LEDs with xenons in 3 distinctive light clusters - available on higher spec grades. Further back the DS 3 still retains some of the model’s trademark features including its floating roof and shark fin C-pillars. At the back the light clusters have received a subtle redesign. Take a peek around the side and those new alloy wheels really do shine, perfectly matching the car's premium styling. DS Automobiles have added even more scope for personalisation with the choice of ten roof decals and four roof finishes amongst the extensive three million colours and trim combinations! Inside, buyers are given a choice of new trims including extra dash colour combinations and the ‘watch-strap’ leather from the DS 4 and DS 5. But the most impressive part of the new interior is the improvements in car-tech. All the vehicle functions can be accessed simply on the new 7in colour touchscreen with built-in Apple CarPlay and MirrorLink smartphone connectivity. On DS 3 Cabrio models the retractable fabric roof can be opened and closed at speeds of up to 70mph! Boot space is the same as the previous model with 285 litres in the hatchback and 245 litres in the Cabrio. To give the driver ultimate comfort while on the move, new assistance systems have been installed such as front and rear parking sensors, a reversing camera and hill start assist for models with a manual gearbox. • 3 Puretech three-cylinder 1.2-litre petrol engines with 81, 108 or 128bhp. • 1 THP 1.6 four-cylinder units with 163bhp and 205bhp. • 2 BlueHDi diesel engines producing 99bhp and 118bhp. A six-speed manual gearbox is fitted standard on all the above engine grades with a choice of a new automatic transmission. 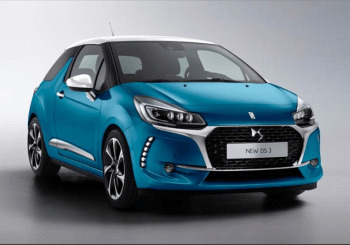 What is most impressive is the 208bhp 1.6-litre petrol engine that is contained in the DS 3 Performance model. It is combined with a six-speed manual gearbox, optimised with shorter gear ratios than the standard grades plus a limited-slip differential for the best performance when it is needed most. Make sure to check out the new DS 3 models at your local Howards DS Salon dealerships located in Weston-super-Mare and Taunton.